Award Winning Ultimate Performance and Fitness Gym Launches New Website , created by GoMarketing Inc. Ultimate Performance & Fitness, a Westlake Village based private fitness and personal training studio, is thrilled to announce the launch of their updated, redesigned website. Boasting a 5,000 square foot facility dedicated to personal training, small group training, and general fitness, UPF is the local resource for those interested in bettering their health and wellness through different training modalities. 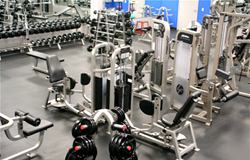 Ivan and his team of trainers are consistently voted “Best Gym in Westlake Village,” banking consecutive awards in 2013, 2014, and 2015, alongside other accolades. Ivan Lopez, President of Ultimate Performance and Fitness, came to GoMarketing, a local digital marketing and web development firm, needing an updated web presence. “I wanted a new mobile responsive site to make it easier for Customers to find us and to present UPF in a professional light,” remarked Ivan, citing the need for a cleaner, more advanced responsive design website. It was important to Ivan to refresh his site with new maps, unique mobile capabilities, and improved long-form content for continued improvement in search engine results pages. GoMarketing spent time with Ivan and his team at UPF to understand his business, facility, position, and overall brand niche in the community. Since UPF is not your typical big-box, membership driven gym, Ivan wanted to tailor the copy, content, and design of the site to engage his target market. After rounds of edits and revisions, UPF and GoMarketing dialed in an updated, modern website that showcases the attention to detail, personal service, and quality training that UPF prides itself upon. Over the past ten years, GoMarketing has constantly endeavored to understand the internet marketing landscapes as it changes practically daily. They offer Software Design, Online Advertising, Internet Optimization, Social Media Optimization, E-Commerce solutions, Website Design and Development, and a host of services to provide our Clients with the best programs to meet their goals. Clients have included, MetLife Inc., Dover Corporation, CBS, TBS, FOX Sports, ESPN, ITC Translations, RealtyTech and many more.